Tommy Rowe insists no one at Doncaster Rovers is looking nervously over their shoulders and the squad remains united by its game-by-game approach. However, the 28-year-old midfielder admits that the next ‘three to five’ games are crucial in what is becoming a drawn-out bid to cement League One status. Rovers must wait until Monday night to host play-off hopefuls Bradford City and then do not play again until Good Friday following the postponement of the Blackburn game on March 24. 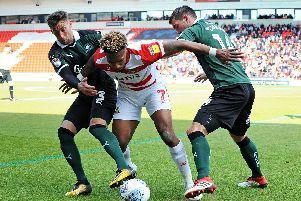 During that period Darren Ferguson’s men could see their five-point safety cushion eroded but Rowe insists Rovers are fully concentrated on the variables they can control. “We don’t look at that [the league table],” said Rowe. “There will be people who do, fans who do and teams that do. “We can’t start looking at it, we just need to take care of what we do on the training ground and focus the way we can improve past performances. “That’s the only thing we need to worry about right now. “Everyone’s got phones these days and internet so it’s harder. But if you’re professional you know not to do it. It’s your livelihood and you’ve got to be professional about it. “We have a lot of meetings together so we all think alike - the managers, the players, the staff. Our philosophy is the same, and that’s the way it has to go if you’re going to achieve something. “I think it’s finely balanced,” he added. “We’re in a position where we can go from strength to strength with a few good results. “The performances have been okay but we want to get to a position a lot higher. Rovers travel to Blackpool on Good Friday and host AFC Wimbledon on Easter Monday.